LARGE MICARTA SEBENZA 21. CPM S35VN Stonewash finish blade. Silver Titanium Thumb lug. Thumb notches, phosphor-bronze washers, bead blast titanium rear handle with integral side-lock. Blast Titanium front handle . Polished stainless screws, pins & pivot. Silver Titanium backspacer washer. BLACK MICARTA INLAYS- FRONT AND BACK. Thonghole, bead blast titanium clip. 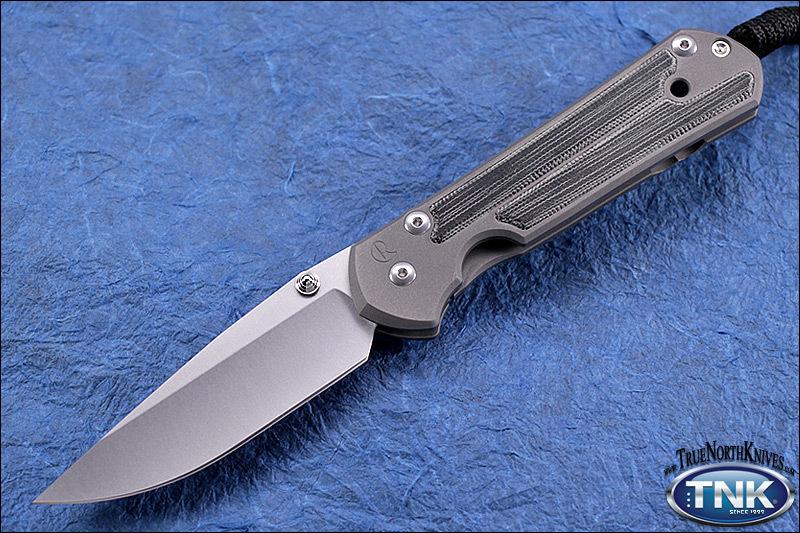 Whether 21, Regular or Classic versions - tumbled or "stonewashed" S30V / S35VN blades with bead blasted or decorated handles - to those with Damascus blades and lavish graphics, each Chris Reeve Sebenza knife is individually fitted to the closest tolerances.